— Dead stock is fabric that is no longer in production. We do this for two main reasons: to make our footprint on the environment smaller and to deliver a truly exclusive product to our clients. Why did you start Ruell and Ray? What’s been the reaction so far? I wanted to make my own women’s selvage jean, since not many people were doing it at the time. I wanted to do all the cool stuff that the men’s brands were doing for women. Our Men’s denim happened to fall into place first because there’s a bigger market for it right now. The reaction has been great, lots of positive feedback. People really love the small details. For anyone who doesn’t know, can you explain what deadstock denim is? Dead stock is fabric that is no longer in production. We do this for two main reasons: to make our footprint on the environment smaller and to deliver a truly exclusive product to our clients. We are in the business of making denim, but producing the fabric is terrible on the environment. By selecting deadstock/oldstock fabrics, we aren’t adding to the orders for pollution. Dead stock also means exclusivity and limited quantities. Each pair is stamped (by me) “1 of 17″ or “1 of 185″. Flamed by my Patagonia background, doing things right where the environment is concerned is important to me. I am inspired by everyday life, every day is a new day to start over and improve. I am excited to see where Ruell and Ray is headed and I look forward to doing some really cool and unexpected things with my brand. Where do you see Ruell and Ray going in the next year? The next 5 years? Right now I am taking it day by day. My goal is to make a good living at what I love doing. If I can do that, I will be happy. We’ve noticed you popping up in some of our favorite online shops (Need Supply and Two Inch Cuffs to name a few). How did this come about? Do you plan on expanding this part of your business? Two Inch Cuffs contacted me in the very beginning stages of our brand. I was new, they where new, so it just worked and I am glad it did. They have a great online shop and they are all great guys. Need Supply was a dream store for me to be in and a good friend of mine introduced me to the buyers. I hope to continue a great relationship with them. I do plan on expanding to different shops but I really want to keep it edited on where we end up. I plan on only a handful of stores in the US and a few internationally. Supreme – They have a crazy following and sell out of their product quickly. They could make more but they don’t and I respect that. They stay true to their roots and they don’t sell out. Union LA – They are THE front runner. Need Supply Co – They take chances on new small brands and I really admire that. They can expect to find the Spence Slim and our newest cut the Handyside Straight. 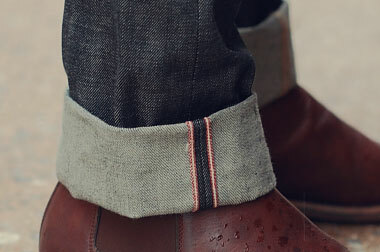 I am really excited for the Handyside because anyone can wear them, it’s a go-to jean. What’s one thing people should know about Ruell and Ray? We are members of 1% for the Planet, an organization that Patagonia’s founder Yvon Chouinard started. We give 1% of our revenues to an environmental group of our choice who is affiliated with 1%. One more thing I would like to add, everything on our jeans is made in the Southeast of the United States (buttons, rivets, thread, labor). The only thing that is often not is the fabric. We’re really excited to see what happens with this exciting brand in the coming years. Do yourself a favor and grab a pair April 28. I have been saving up to buy my 1st of hopefully many pairs of Ruell and Ray jeans! I can say, I knew Ashley James when she was a young girl. Exuberant is a very descriptive word for her, then & now! Much luck and success to Ruell & Ray and Ashley James!!! Good Luck my friend!! Killer jeans. Killer brand. See you on the 28th!